Miguel Cabrera is an amazing hitter, and that makes him an awesome baseball player. He’s hitting .358/.460/.589 in 404 PA this year, which is good for a 186 wRC+. Per plate appearance this is the second best offensive season of his career, second only to 2013. This isn’t his best year when it comes to extra base hits, but he’s getting on base more often than he ever has. Some of that is his 15.6% walk rate, which is narrowly the second best mark of his career, and some of it is his .408 BABIP, which is the highest BABIP he’s registered to date. Cabrera is a high BABIP guy. You generally expect a .350 or so BABIP based on his talent level and over 400 PA it’s not crazy to see a number 60 points higher than expected. It’s not common or likely to continue at quite this rate, but it’s not like he’s going to crash back to Earth when his BABIP “luck” runs out. He’s having a great year at the plate and it’s skewing a little more toward singles and walks than doubles and homers, but it’s great all around. The thing about Cabrera is that when it comes to hitting, he’s great at everything. He’s not an effective base runner because he’s slow and he’s not a great fielder, also because he’s slow, but in the batter’s box he is one of the five best hitters in the game and heading toward a late July speech in upstate New York. He’s incredible. Due to that dominance, it can sometimes be hard to find interesting things to say about him. He is good and consistently so. 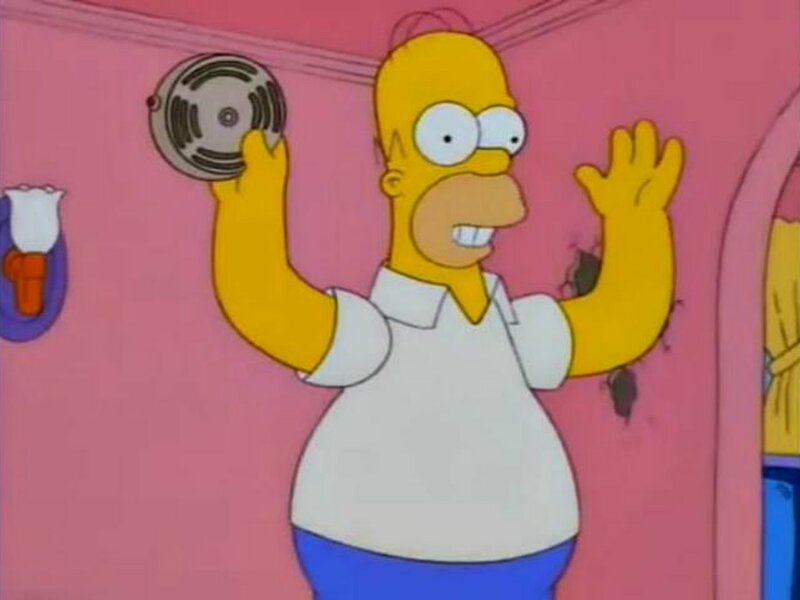 Writing about him too often is akin to Homer’s everything’s okay alarm. But given that there’s a lot of depressing baseball going around, we do have to circle back on the things that are going well from time to time. Cabrera is one of those things. We know about his great season overall. He’s missing some plate appearances due to the calf injury, but that 186 wRC+ is impressive. One thing that’s worth pointing out is that Cabrera’s batted ball distribution is taken a bit of an interesting turn this year. Cabrera is hitting the ball the other way much more this year than he has in recent seasons. It’s the highest number of his career and his first time over 30% since 2010. He’s consistently been hitting 25-28% of his batted balls to right field during his career with a couple of years in the 30-31% range. This year, it’s 33.5%. 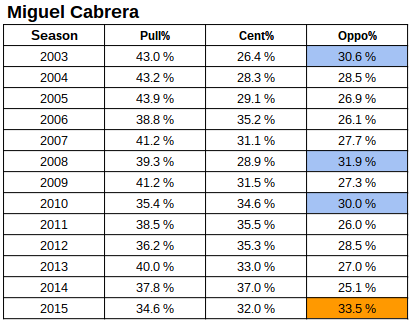 I think a lot of people think of Cabrera as being an “opposite field hitter,” but he actually hasn’t been a big outlier in his career. the Average hitter is around 40-35-25 and his typical season is 40-32-28. The real reason you believe Cabrera is an a guy who hits to all fields is that he absolutely crushes the ball the other way and most hitters don’t. Here’s his career directional splits compared to 2015 league average. Take these with a grain of salt. It’s been a long career and there are no controls for handedness of pitcher, etc. But you’ll notice that Cabrera has generally stood out more to the pull field than the other way. He’s one of the best handful of opposite field hitters when it comes to damage done, but he’s actually been better compared to average when pulling the ball. So what does this mean, exactly? Cabrera is hitting the ball the other way more often – a lot more often – this year. Is that a good thing or a bad thing? If you use his career directional splits as a proxy for the better directions, you’d want to avoid adding extra batted balls the other way, even if he’s still very good in that direction. This year he’s 216-287-189, FYI. BABIP-wise, he’s killing it to center and right (120 and 80 points above career norms) and is right around his career average to the pull field. Keep in mind this doesn’t count home runs. His ISO to the pull and opposite fields are normal-ish and it’s way up to center. Package it all together and you have a pretty normal set of batted balls to left, more average and power to center, and more average to right. Generally, over 400 PA I would say this doesn’t mean a whole lot. My theory is that there was a certain population of pitches that he’s decided to push the other way instead of trying to pull them. That’s probably an obvious statement, but if you read into it a bit more closely it makes some sense. Cabrera has the ability to crush baseballs, but going to the pull power swing has its tradeoffs. You run the risk of whiffing or being out in front and generating weak contact. If Cabrera is waiting back a little more often, he’s going to set himself up for more hits the other way, but they will be a little less forceful overall. Theoretically, if you take his worst swings to center away and give them to right field, it has the effect, potentially, of increasing production in both directions. Each hitter has a perfect balance of power/contact for their own skill set which will maximize their offensive value. A guy with already low contact ability might want to really sell out so that he can get a couple extra homers or a high contact guy might want to avoid too many big swings because his best contact is warning track power. Cabrera, being an elite hitter, has a tougher decision and he has to react to the new ways pitchers try to pitch him. That’s why it’s kind of hard to know for sure. Is Cabrera hitting the other way more often because he’s being forced to or because he wants to? The pitch locations don’t look much different, but he’s generally being more selection this year as well. It’s hard not to notice how often he’s gone the other way this year, and it’s helped him a put together a great season. Is this happening because he feels like he doesn’t quite have the power he once did and is adapting, or is he simply making the most out of the pitches he’s received? Sorry I don’t have a definitive answer to the question. I really just wanted to point it out and call attention to where he stands as an opposite field hitter. He’s one of the best there is from a value standpoint, but until this year, he wasn’t a particularly likely candidate to hit a ball to right field relative to league average. But this is a thing he’s doing more this year and it’s working so far. The main takeaway, I think, is that this is a roadmap for an aging Cabrera. At some point, he won’t be able to deliver the consistent bat speed needed to be an elite hitter. It’s coming. Probably not next year, but he’s under contract until his 107th birthday, so it will happen eventually. His ability to go the other way more and more often might allow him to offset some of that loss. This might be practice. Albert Pujols went with the all dingers-no OBP model of aging, but Cabrera might be able to implement an all hits-fewer dingers model that will serve him well. I’d treat this opposite field thing as a beta test. Cabrera is flashing a tool he generally hasn’t flashed. He hits well the other way, but now he’s doing it more often without hurting his results. It could always be randomness and pitcher fluctuation, but it could be a trial run for a smooth landing into old age. At one point it seemed inevitable. After Verlander twirled his second no-hitter, a near perfect game, one Saturday afternoon in May 2011, it seemed like a foregone conclusion that he would throw another. He nearly threw one against the Angels later that year. Nearly no-hit the Pirates a year later. He was the best pitcher in baseball with the no-hitterest stuff in the game. We know the rest. Verlander struggled during the middle of 2013, wasn’t healthy and struggled mightily in 2014, and spent most of the first half of this year on the shelf. The aging erstwhile ace didn’t necessarily look done, but his days atop the league were over. Yet over the last month, he’s pitched very well and has quietly started to look more like a pitcher who could make an impact again in the future. Tonight, the Verlander who demanded our attention every fifth day came back to us. I won’t suggest that this start means he’s back or that he’ll be great. Even the last 7 starts don’t mean that. This start is a proof of concept. A reminder, and evidence that he still has the ability to have nights like these. He had heat, and he was able to locate it. The guys in the modern era with three or more no-hitters? Cy Young, Bob Feller, Sandy Koufax, and Nolan Ryan. It’s a short list that nearly included Justin Verlander. The other four are Hall of Famers. Verlander’s shot at that honor looked like a long one two months ago, but it’s a bit more plausible today. A no-htter itself is more of a fun-fact than a real event. Verlander walked two batters before he allowed the hit, but for good measure he erased them on double plays. It was a brilliant start whether he allowed one hit or none, and it came at a nadir for the organization. It’s been a long, grueling, depressing season for Tigers fans. Tonight, baseball was fun and it was nice to feel like it mattered again, even if it was only for a few hours. Is It Possible That Jose Iglesias Is Just An Okay Defender? So why am I wondering if Iglesias is having a meh year with the glove? Or let’s say, an average year. According to Defensive Runs Saved and Ultimate Zone Rating, two of the leading defensive statistics in baseball, he’s been worth -2 DRS and 1.5 UZR relative to other shortstops. In other words, he has been about average relative to his peers. Now certainly an average shortstop is more valuable than an average left fielder, so when you factor in the positional adjustment, Iglesias’ defense has been worth 5-7 runs above the average defensive player. That’s a fine number, but it’s not an exciting one considering the tools we see him flash. Iglesias isn’t awesome and this is a normal year. Let’s consider them in turn. The first is the explanation most people will latch onto. You have watched Iglesias enough to know that he makes very difficult plays. That is a fact about which we can all agree. He makes great running catches, throws on the run, etc. We have seen him display this ability enough times to recognize it as a skill. It’s there, so the fact that the stats are saying otherwise is likely evidence that the stats are incorrect. This is a plausible hypothesis. Defensive stats like these are based on imperfect data. Fielders are judged based on their performance relating to similar batted balls elsewhere in the league, both as a matter of making plays and how valuable it is to make each kind of play. But the data is based on a number of things logged by humans, who are imperfect, and an algorithm that was programmed by humans. DRS and UZR aren’t like on-base percentage where we can say for 100% certain than a player reached base. OBP’s flaws are a product of how much credit the player should get for each time on base, but no one disputes and there is no argument about whether it happened or not. For defensive stats, this isn’t always true. Depending on how you design your program, a ball one system thinks is a 60/40 play (i.e. 60% of the time a SS makes that play) might get called a 70/30 play by another. The system can definitely tell if a play was made or not made, but it is estimating the difficulty of the play and the value of making the play. Right now, both systems think Iglesias’ value has been about average. It’s only been 922 innings of play this year. We’ll get to this later, but most defensive numbers are swung by a small number of plays each year, so if the system has a certain number of errors in measurement, 900 innings might not be enough for the flaws of the methodology to get washed out. The second option is that Iglesias is very good, but he is just having a bad season. This one is the most likely explanation to me on its face, but probably the one people are least likely to accept to begin. We have this idea that defense and base running are not variable skills. That is wrong. If a batter has a 120 wRC+ one year and then hits 98 wRC+ the next, no one jumps up and down blaming the stat. Maybe the player had bad BABIP luck, maybe they didn’t hit for as much power, or maybe they struck out too much. It happens. Performance year to year isn’t consistent. The same is true for defense. So it’s possible that Iglesias is generally as talented as we think, but he’s just had some bad games or plays. Think of it like a starting pitcher. Remember 2013 Verlander? You blocked it out? Allow me to remind you. He was awesome in April and September and not so awesome in between. No one argued that the stats were to blame for this varied season, he simply pitched better at one point in the year than others. Defense can work the same way. Maybe you’re nursing an injury, or maybe you’re just fumbling your footwork. It happens. In 2013 we saw Verlander hit 98 that night he got rocked in Texas. We all knew he still had the raw skills, but he didn’t execute. The same could be true for Iggy. The range, arm, and hands are clearly still part of him, but maybe he has failed to use them as effectively as possible over this 900 inning sample. The final theory is also possible. Maybe he just isn’t as good as we think. I think this could be true in a roundabout way. I’m not arguing he doesn’t have a good arm, but way too many people think defense = skill and it doesn’t. Defense is about a player’s ability to turn batted balls into outs. If you have a cannon for an arm, but you can’t get the ball out of your glove quickly enough, the arm value diminishes. Maybe you have a great arm, but perhaps you make good throws inconsistently. An outfielder might be super fast and have the ability to read the ball well, but maybe their first step just isn’t up to par. You have to be able to consistently execute in order to be a good defender. Maybe that isn’t true for Iglesias. Perhaps he has great tools, but sometimes can’t make them work in his favor. I’m not saying this is likely, but it would fit with the facts that he looks amazing but his numbers haven’t been great. So let’s jump back to the facts. In his career, Iglesias has about a season and a quarter of innings at shortstop. He has 5 career DRS and 10.9 career UZR. He’s somewhere between +3 and +8, let’s say over a full season so far. A great SS would be 10-15, with generational talents in the 15-20 range per year. It could definitely be sample size and a flaw in the system. The best way to test this is to look at other evaluations and other indicators. The first thing we have to establish is if, in fact, Iglesias isn’t having a productive defensive year. My favorite quick test for infield defense is BABIP on ground balls to your general area. This is essentially a very rudimentary metric. I carved up the field and looked at ground balls. Granted, Iglesias hasn’t played every inning at SS and there are positioning considerations and such, but let’s just use it as an independent test. If we give him 55% of the left side (angle-wise), the Tigers have allowed a .299 BABIP, which ranks 30th (.251 is average). If we give him 65% of the left side, it’s .323, which ranks 30th (.259 is average). Now this is just ground balls and is not at all sophisticated, but it generally lines with the idea that Iglesias isn’t converting a ton of batted balls into outs. Of course there is a Castellanos factor, so let’s be really nice to Iggy and only give him 45% of the field, which no 3B would ever cover. BABIP of .233, which is only 9th worst! Still not the mark of a good shortstop. We also have access to Revised Zone Rating, which measures the percentage of balls in his zone (plays that get made more than 50% of the time) that he has turned into outs. This year it’s 77.5% which ranks 18th among qualified shortstops (25 in total). Per inning, no one has made fewer out of zone plays than Iglesias too, and only Wilmer Flores has the same number. Another point against him. Let’s move to Inside Edge, which is a totally different company than bins plays based on how difficult they are. No run values, just difficulty and if the play was made. He’s 259 for 264 on the easiest set of plays, which ranks 9th. He’s 18 for 25 on the 60-90% play range, which ranks 14th. He’s 8 for 11 on the 40-60% plays, ranking 5th. He’s 3 for 13 on the 10-40% plays, ranking 14th. He’s 1 for 11 on the 1-10% plays, ranking 3rd. So the Inside Edge data generally backs up what we’ve seen. Iglesias has been average or a touch better by their methodology. He’s made 89% of the non-impossible plays (plays literally no SS could make) this year. That’s a fine number, but not a great one. Keep in mind this doesn’t cover double plays and tags and such. So the data does seem pretty clear. Iglesias is making an unimpressive number of plays. No one is contesting he has made some very difficult plays, but it does seem like the raw totals are lacking. He’s not bad, but he’s not preventing a large number of total runs. So what’s the explanation? What does this all mean? I think the “stats are wrong” argument is weak. We’ve sliced and diced this with a variety of numbers and the same thing keeps coming up. I mean, he’s even 16th in fielding percentage, as useless as that stat may be. There isn’t a good case to be made that the numbers are somehow tricking you. So either he’s a good player having a bad year, or he’s not as good as we think. Maybe we should blend the two categories. Here’s how I see it. Iglesias is obviously extremely talented. But he seems to fail to execute a non-trivial amount of the time. Sometimes that means he boots a play, sometimes he gets cute and makes a bad throw, sometimes that means he doesn’t go all out after a ball up the middle. Presumably, this is a correctable issue. We’ve seen him flash these tools plenty, so it’s about some type of extra work. It might be mental focus and it might be extra reps to get out of certain bad habits. Very few players, if any, can get to some of the balls he gets to while making the kinds of throws he makes. By talent, he’s probably one of the best three shortstops in the game. But by results, he’s in the 10-15 range this year. Maybe he’s just having a bad year, but it’s not like he’s been immune to this in the past. Defense isn’t just about being able to make the play, you have to actually make it. This is not a trivial distinction. Almost every pitcher can hit the corner with a fastball, but the great pitchers are the ones who hit the corner the most. The same is true for defense. And it’s especially true because the difference between good and great defenders comes down to about two plays per week. So much of defense is routine that separating yourself from the pack means you can’t make very many mistakes and have to convert the plays that make the biggest difference. I’m confident that Iglesias is capable of being an elite shortstop, but I also think it does seem like he gives away a number of runs he saves by botching relatively easy plays. Few make the tough plays as well, but many execute the slightly difficult better. This may be a surprising conclusion, but I think it’s well defended. Just because a guy makes great plays, that doesn’t make him a great defender. There is more to it than that and Iglesias has yet to truly dominate in that facet of the game. This will be short and sweet. The Tigers offense probably frustrates you! Not as much as the pitching, because the pitching is bad, but the offense annoys you because they don’t seem to be scoring as many runs as they should. You’re right about that. The Tigers currently have a 108 wRC+, which is 4th in all of baseball. That’s quite good. Using something called BaseRuns, which is really just a fancy formula that takes individual stats and turns them into an expected number of runs scored for a team, the Tigers should be scoring 4.80 runs per game. They are actually scoring 4.45 runs per game! What does this chart mean? The first column is RE24, which tells you the amount of runs (relative to average) each player has contributed as a result of their plate appearances’ influence on team run expectancy. Or, in English, RE24 gives you credit for how much you increase your team’s chance of scoring in each PA. If you come to the plate with a man on first and you hit a single, you get credit for the difference between the run expectancy with a man on first (situation when you came to the plate) and the run expectancy with a man on first and second (situation when your PA ended). This varies based on the game situation when you come to the plate. 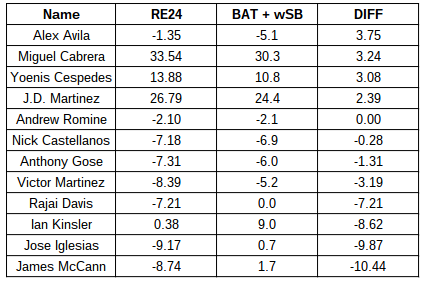 The second column is batting runs and stolen base runs added together, which is another way of measuring the same actions, but this time, we only care about their average value. A single is worth the same if the bases are loaded or if they are empty. The first column is a measure of context adjusted runs and the second column is context neutral runs. In other words, if you could pick when you got your hits, you’d want them with men on base because they lead to more runs that way. Over a large enough sample, they two columns will converge. You would expect a few runs in either direction just do to random variation, but if you had to pick, you want RE24 > BAT + wSB (i.e. positive numbers in column 3). Look at a couple of those Tigers (min 100 PA). Davis, Kinsler, Iglesias, and McCann (who are all having fine offensive years) are timing their hits really poorly. They are getting hits with no one on and they are making outs with men on base. Add up the four worst guys on this list and that accounts for roughly four wins lost to bad offensive timing. Now, players can’t control this. There is no such thing as a player who can magically dole out his hits at certain times. It’s all basically luck, but it’s a clear example of how bad the Tigers luck has been in this department. The pitching is the problem, but you aren’t imagining the fact that the offense isn’t helping. This isn’t a predictive problem, but it’s one more annoyance to add to the 2015 season. Anibal Sanchez has not had a good season. It hasn’t been horrible or anything, but he’s been a below average pitcher for the first time since 2008/2009. He has a 4.82 ERA and 4.47 FIP (120 ERA-, 113 FIP-). He’s clearly been better lately than he was earlier on, but it’s not like he’s been the dominant Sanchez we came to know and love. It’s easy to recognize the direct cause of his poor performance: He’s allowing too many home runs. He’s allowed 1.51 HR/9 or 25 total. Both are career highs. Heck, he only allowed 33 HR from 2012-2014. It’s a problem. But if you look at everything else, it’s not a bad stat line. His strikeouts don’t match the dizzying high of 2013 and the walk rate has come up from his 2014 mark, but it’s not like he’s been susceptible to anything other than dingers. We’ve seen some hard contact, but his double and triple rate hasn’t seen quite the same concerning spike. It’s not 100% about dingers, but it’s mostly about the dingers. Before we get into it, I want to play with his stats a little bit. Sanchez had an insanely low HR rate in 2013 and 2014 and it’s wrong to predict he’d keep it up. But it’s been low in his career, around 0.8 HR/9 even after the shock of the 2015 season. To give you an idea, the difference between 1.5 HR/9 and 0.8 HR/9 over his 149.1 innings this year would be about 11 HR. Sanchez’s current RA9 is 4.94. His current ERA is 4.82 and his current FIP is 4.47. On average, a home run is worth about 1.39 runs (i.e. the run for the batter plus the average number of runners on base). If we subtract 11 HR * 1.39 runs per HR from his 82 runs allowed, his RA9 drops to 4.02! If you do the same with his earned runs, you wind up at 3.90. The funny thing here is that Sanchez has allowed a higher proportion of earned runs to runs than is normal for a pitcher (roughly 92% of the league’s runs are earned per season). I would generally tell you that ERA is pointless and RA9 is better, but just for reference, if you take a 4.02 ERA and translate it to an ERA based on the normal share of ER to R, you get 3.70. In other words, if Sanchez was doing everything the same, except he was allowing a HR/9 typical for his career you might expect 3.70 ERA. If we do the same thing with FIP, we wind up at 3.52. This isn’t a perfect method, but the unusual number of home runs is basically responsible for about a full run per 9 innings on Sanchez’s stat line. That’s pretty crazy. His ERA- would be 92 and his FIP- would be 90. That’s a huge difference. You don’t even have to regress Sanchez back to his great 2013 and 2014 numbers, you just have to take him back to his career norms. The difference is one home run every other start. Baseball is really that close sometimes. Now, I am absolutely not trying to argue that Sanchez’s HR trouble is randomness or bad luck. Maybe a portion of it is, but he has definitely served up some bad pitches which got crushed. But let’s ask the important question. Why has he allowed so many more home runs that normal? What’s causing this insane spike? First, he’s allowing more fly balls, about 4-6% more than he typically has. That translates to about 21 extra fly balls this year. Even if you apply a normal HR/FB% to his fly balls, you’re still only explaining some of it, and like I said, I don’t really want to just throw regression on this and call it a day. More fly balls, and those fly balls are going for home runs more often. In April, I looked at his first six dingers and pointed out they were basically just bad pitches in otherwise fine outings. He happened to get tagged hard when he got tagged rather than occasionally getting away with one. So I set out to watch all of his 2015 home runs. I won’t include GIFs for them all because that would take forever to load, but I do want to point out a few things. First things first, they were all pretty much meatballs. I wish we had an easy measure of how often a meatball goes for a home run and then how many total ones he’s thrown. Maybe 50% of meatballs usually go for dingers and he’s just allowing that on 80% this year. Or maybe he’s allowing homers on 50%, but he’s throwing a lot more bad pitches. One thing we can say with some confidence is that this isn’t a bad pitch selection problem, because he’s getting tagged when he’s throwing the ball much differently than it’s being called. If McCann calls for one low and away and Sanchez hangs one up and in, that’s an execution problem not a game plan problem. So there are essentially two ways to look at this. Is Sanchez locating pitches poorly, leading to pitches that are easier to hit, or is he throwing with worse stuff, making pitches easier to hit? Let’s think about some ways to look at this. Thing number one is that Sanchez’s contact rate allowed is virtually identical to 2014 and most of his other seasons (2013 is the awesome outlier). So when batters swing, they are hitting the ball as often as they used to. So it’s not that it is easier to make contact with in the first place. And they are actually swinging a bit less often against him, suggesting that they may even be laying off his most unhittable stuff. Presumably, this is a damage on contact problem. So when hitters make contact against him, the results were way down for hitters last year and are way up this year compared to his 2012-2013 baselines. We were expecting to see this, of course, because we know about the dingers. So let’s try something. Let’s take those 11 HR we think are weird and let’s turn them into doubles. Let’s see what happens. His wOBACON for 2015 goes to .361. That’s roughly a six run difference for the season, which gets us about half way to that 3.70 ERA we mentioned earlier. If they all get turned into outs, it’s goes down to .331, or about 17 runs! Okay, so this is all about what’s happening for those roughly 440 batted balls and why he’s allowing more damage on them this year than we’ve seen in years past. Let’s use 2013 as a test case. Let’s compare his pitch locations on batted balls for 2013 and 2015. But first, let’s take a peak at his platoon splits for those years. In that case, let’s only look at right-handed opponents. That doesn’t tell us a whole lot. The distribution is a little different, but we can’t really see a clear pattern. The batted balls generally seem to be thrown to the same spots against righties. How about the movement or velocity? Here are the average velocity and vertical and horizontal break. Let’s look only at the fly balls, however, because we care about how these balls are being hit. Remember this is on pitches to righties that were put in play. So I have one last idea. Let’s compare his 2015 HR to the average marks for 2015 fly balls. Again, just righties. I’m not going to bother showing it because the sample is small and there’s nothing to see. And I’ve already probably carved these into samples that are too small, so digging into granularities any more will only confuse us. I hate to do this to you, but we’ve come at this from every angle and I can’t explain it. Anibal Sanchez’s bad season is based entirely on a home run problem that I cannot explain. His pitches aren’t worse overall. He’s not throwing them to different spots. He’s not throwing them very differently. There is no good reason why this should be happening. That seems like a terrible answer to our question because we have all watched him give up a ton of home runs, but we’ve also watched him do this thing where he totally cruises for 12 batters after allowing a big dinger. He’s himself, and then he’s terrible for a pitch, and then he’s back to normal. This is the weirdest home run problem I’ve ever seen. I really wanted to find something because I want to be able to point to something as a place he needs to improve to get back on track, but this looks like some cosmic intervention where his ability just leaves him for a moment at a time. I wish I had something better than this, but I don’t. Anibal Sanchez is giving up a lot of home runs. Sometimes that just happens to a guy who is pitching fine otherwise. I won’t try to say they aren’t his fault, but I do think the best explanation we have for what’s happening is that these are just isolated moments of failure rather than a pattern. He’s not doing something systemically that’s leading to this adverse outcome. It’s just happening. Baseball is often wonderfully mysterious, but in this instance, it’s mysteriously cruel. My initial read on the big Tuesday in Detroit went something like this. Dave Dombrowski wasn’t planning to return to Detroit next season, and once the team folded for the season, Ilitch decided to get the transition going early, while affording Dave a chance to interview for other jobs sooner rather than later. We all had our theories, and let’s face it, none of us actually knows what happened. It was weird and the Tigers keep things close. This afternoon, however, Dave started returning some calls to media members looking for comment and said some version of the following: 1) Ilitch only told him he wanted to go in a different direction, 2) There were no contract extension talks, 3) He found out on Tuesday before the team was told. Dave spoke with several different reporters and basically told the same story each time. It fits with the narrative we heard from Al Avila and the brief press release from Mike Ilitch. Ilitch decided to change course and it unfolded quickly. Everyone was cordial and Dave is now a free agent. Maybe you disagree, but I pride myself on the fact that I will give any idea a fair shake. I think I know what happened here, but let’s try and put together a story that fits the facts of the case that fits the narrative we’ve been told. Let’s assume that Dave actually wasn’t told he was out until Tuesday. It seems like he saw this coming based on the fact that Ilitch hadn’t approached him about a new contract, or at least based on the way he was behaving prior to the decision. That’s easy enough to accept. It’s totally plausible to imagine Ilitch wanted to replace Dave. It doesn’t seem likely, but I have no difficulty accepting it as a reasonable thing. Okay, so if Ilitch didn’t want Dave back, it makes logical sense that his firing would occur after the team called it quits for 2015. So basically this could occur any time in the week leading up to the dismissal. So far, so good. Let’s say Ilitch made the internal decision to fire him once the organization decided to sell. Let’s say that happened last Monday. Could be Tuesday, but I’m almost certain that Dave went to the clubhouse last Monday to tell the coaches they were selling. Let’s assume the ouster was written on the wall then. So far, so good. Ilitch wants to replace Dave and he’s decided to do it now that the team won’t win a title in 2015. Replacing him with Avila is also a plausible move. Avila is clearly a guy that’s been groomed for it, he’s worked for Ilitch forever, and we now know he was working under a deal that prevented him from taking other interviews. Clearly he was highly valued by Ilitch. So it’s very easy to imagine a situation in which Ilitch decides to cut Dave loose around now and picks Avila to replace him. I can understand this so far. Alright, so the thing we have to really figure out is the timing. If Ilitch decided to fire Dave, why did he leave him in place to manage the trade deadline? The main argument people have made is continuity. It would be chaos if you shook up the organization right before the deadline. Avila is capable, but it would be pretty crazy if his first few days on the job were spent trying to make huge trades with a sense of uncertainty. So it makes sense if we assume that Ilitch decided shortly before the deadline and determined that installing a new GM right before the deadline would be pretty nuts. Okay. I can buy that. Ilitch had lost faith in Dombrowski, but he didn’t think he was incompetent. He was more than capable of trading a couple of players, which Ilitch signed off on. So he let the front office handle the deadline, and the next day he offered the job to Avila. He could have waited a few weeks to let it breath, but the big decisions were made and then it was time to start focusing on 2016, and that was going to be Avila’s job. Ilitch could have waited a few more days or a couple weeks, but so what? That’s not a big problem. Ilitch decides he doesn’t want Dave back, so he doesn’t engage him in contract talks. He doesn’t plan to extend him, but he leaves it open until the team decides the season is over. Once that happens, his mind is made up, but it’s too close to July 31 to make the change, so he waits until that’s over to switch regimes. Personally, it seems like Dave has earned another contract if he wanted it, and if Ilitch wanted to go another direction, installing his top lieutenant is an odd way to go, but all of that is reasonable and it fits with the story we have been told. It happened kind of suddenly, but really Ilitch had made up his mind a while ago and the actual events unfolded in a tight window. It makes sense. It’s weird, but it makes sense. I think this is a perfectly logical theory and it’s one that fits the story we have been told. It seems less likely to me as an actual series of events than my theory about what happened, but there’s nothing about it (yet) that doesn’t fit. But there’s one big detail that’s bugging me and there are only two ways to explain it in a way that makes it fit with this story. Both Dave and Al said that Mike Ilitch didn’t give Dave or Al an explanation beyond the fact that he wanted to go in a different direction. This is the part of the story that doesn’t fit. The easier explanation to grapple with is that Ilitch did explain himself but neither party wanted to talk about it, so they agreed to just keep it between them. I can believe that. And it’s plausible because it doesn’t help either to air the grievances, and because if I was Al Avila I would not accept a job offer without an explanation for why my boss was just fired. Avila isn’t stupid and I’m sure he was interested in figuring out the direction the owner wanted him to take the franchise. Okay, so that fits too, BUT you to accept that everyone is lying. That’s fine. I’m totally on board with them lying about that, but if they’re lying about that, they could easily be lying about everything. The important thing here is that this version of the story makes Mike Ilitch look like a jerk and it makes Avila look foolish. So a lie here fits with the story, but it also means the club is willing to lie to tell this story, which means if you believe this, you have to be open to the bigger lie, and that brings you into my world from yesterday. The other explanation is that everyone is telling the truth. I guess that’s Occam’s Razor. But if everyone is telling the truth, you know what that means? Mike Ilitch is kind of a jerk and Al Avila is pretty foolish. And neither of those things fits with what we know about them. I guess it’s possible, but I have such a hard time believe that Ilitch fired Dave without an explanation after 14 years of great stewardship. Dave Dombrowski may not have earned another contract, but he certainly deserved an explanation. I know Dave said he wasn’t owed one, but he was. He did right by Ilitch and to can someone after such a long, successful tenure without an explanation is not a good way to do business. Most people won’t remember, but you have to think it hurts Ilitch’s credibility with his other employees. Ken Holland comes to mind. Whoever is in charge of the pizza, as well. It looks bad for Mike to do Dave like this. And boy, it seems awful foolish for Avila to get offered a job without talking to Ilitch about what Mike was unhappy with from Dave. Because, well, you know, Avila was a big part of those decisions. To get a good feel for what his job was, Avila needed to know why Dave was fired. It is totally illogical that you wouldn’t ask for an explanation and it would be unreasonable of Ilitch not to give one. So let’s summarize a bit. Option 1: The story is wrong, and my theory from last night about Dave basically quitting holds. Option 2: The story is right, and they are lying about the explanation part. Option 3: The story is totally right. It’s basically one of those three. The problem I have, and the reason I can’t bring myself to accept the narrative is that Option 2 seems most likely, but also kind of deflates itself. If you accept one lie, it means that the parties are willing to tell a lie about this situation and it unravels. And if Option 2 isn’t it, and then I’m right about what happened and Dave is walking a thin line between politically correct and whatever the opposite is. That also seems weird, but I guess more satisfying. Which makes me worried it’s Option 3. If it’s #3, the story fits, but the owner and the new GM come out looking bad. And that doesn’t make you feel very good at all. So here’s the skinny. Either something is a lie, or something went very wrong. I want to believe it’s the first, but at some point you have to wonder if it’s the second. And the second scare you a little bit, even in the wake of a terrific trade deadline that set the franchise up for future success. Everything went really well last Thursday and Friday, and the very next thing that happened may have shown flaws in the franchise’s two leaders. I’m going to take care of you next year. Before knowing what other teams would offer, Ilitch was committing himself to a hefty some of money because he felt like Victor had earned it. Victor’s conduct over the course of the season, and his time in Detroit, was enough for Ilitch to make that promise. It’s just one story, but I think it’s pretty good reflection of the Ilitch we think we know. He comes through for his guys. He takes care of them even if it’s not the financially savvy move. Sometimes even if it isn’t the right baseball move. There are two ways to explain what happened inside the Tigers organization over the six days. The first explanation is that Mike Ilitch lost confidence in Dave Dombrowski to the point at which he fired him. The second explanation is that Dombrowski decided he didn’t want to be a Tiger anymore. I’ve been thinking about it and reading the quotes for the last few hours, and while I certainly don’t know it for sure, I’m basically convinced it’s the latter. I don’t think Mike Ilitch fired Dave Dombrowski. I don’t think he fired Dombrowski because if this was a firing, it was the weirdest one I could imagine. If Ilitch was planning to fire Dombrowski, why would he leave him in charge of the franchise altering decisions made last Thursday and Friday? If he wasn’t planning to fire him, and then decided to after the deadline moves, why would he have approved the decision to sell? Certainly he couldn’t have been unhappy with the return, which was universally adored. Even if you get past those questions, you have to wonder why Ilitch would fire Dombrowski only to leave every other member of the front office and coaching staff in place, while promoting the man Dombrowski has been grooming for two decades. If you can get beyond that, you have to explain why the press release said Dave was being “released” from his contract to allow him to “pursue other business opportunities.” The other business opportunities part really stands out. Like the Ilitches wanted you to know that Dave is very much thinking about his next job. I just can’t put together a logical string of events that starts with Dave getting fired and ends with the announcement happening the way that it did. And that’s before we get to the elephant in the room: Dave Dombrowski had earned as many chances as he wanted from Mike Ilitch. Ilitch hired Dombrowski to resurrect a tire fire of a baseball team and he gave his boss five trips to the postseason, two pennants, and just three non-competitive seasons since the 2006 revival. And that’s before you talk about the attendance spike and untold value Dave has brought to the Ilitch portfolio. If anyone’s past performance has earned another contract, it’s Dombrowski. Maybe you can imagine a better GM, but if Ilitch is the kind of guy who pulls you aside and says he’ll take care of you, Dave is the guy you pull aside because of what he’s done for you. I won’t sit here and pretend that I was always in Dave’s camp. I’ve offered plenty of criticism, but his track record is remarkable. It’s ironclad. He has made mistakes and has his flaws [glances at every hard throwing lefty you’ve ever seen], but he routinely made smart decision after smart decision and built a perennial winner. He turned nothing into a powerhouse, and some of the worst decisions of his tenure were clearly guided by ownership. I can’t imagine Ilitch looking at the last five years and thinking one bad half erases all of that, and I can’t imagine him thinking that the only part of the beast worth removing was its head. No, I think Dave decided it was time to pursue other challenges. I think this decision was made a while ago. Fourteen years is a long time to have the same, high stakes, stressful job. His contract was up at the end of the year and I think Dave had decided he wasn’t coming back. Ilitch knew it, and once the team decided they were going to punt on 2015, Dombrowski didn’t really need to be there. He led his staff through one final deadline and then it was time to part ways. There are some good openings right now. Toronto, Seattle, and Boston are looking for new captains. There’s probably a job waiting for him at MLB if he wants it too. I think Dave made the decision that 2015 was going to be his last as a Tiger, and once the organization decided the season was over, it no longer made sense to hang around. Both Dombrowski and Ilitch owed it to Al Avila to give him the reins and Dave probably wanted some time before taking over a new team. And so it happened a little suddenly, but it happened in a way that made sense. Ilitch wasn’t unhappy with Dombrowski’s performance, but I do get the sense he was unhappy that he was leaving. That might explain the edge to the press release and the fact that Avila made a comment about working for the Ilitches for the rest of his career. I think that was a very clear message that the man who was leaving did not share that commitment. If anything, it feels like the breach of loyalty was felt by Ilitch from Dombrowski rather than the other way around. Dave decided to leave, and there were a few hurt feelings about that fact. No one said “fired,” or “let go.” He was released from his contract, because his current contract forbade him from interviewing for the jobs he wanted. It was a negotiated peace. It was a long time coming, but when it finally arrived it still felt sudden. Like I said, that’s my theory of what happened. I can’t really assemble one that fits all the pieces any better. Dave was ready to leave, the team packed it in for the season, and Ilitch basically told him you’re welcome to leave now. And so he did. A long relationship ending not because anything went wrong, but because it was time for the parties to move on. At this point, it’s worth looking back and looking forward. To look back, we have to acknowledge what happened in Detroit over the last decade and a half. Dave Dombrowski built a franchise so strong that we’re pissed off if they have an okay season. He traded for superstars and found diamonds in the rough. The Tigers won and won and won under his leadership and every time it looked like the run was over, he found a way to restart the clock. First it was Cabrera, then Scherzer, now Norris and co. Rating a GM or a front office accurately is a fool’s errand, but the Tigers clearly benefited from his cool-headed leadership. It’s easy not to be satisfied until the flag flies in center field, but I would imagine most fan bases would trade their last decade for ours. Even without the big one, it was one hell of a ride. The Tigers went from Lions to Red Wings in just a few short years. And what becomes of the Tigers now? Without Dombrowski, who will the Tigers be? Al Avila has been preparing for this moment his entire life. He has the experience to do the job and has been by Dave’s side since the beginning. You never really know what you have until you see it in action, but if you are trying to replace Dave, this is definitely the guy. He was probably ready five years ago and will take over a club with a restocked farm system and a much better outlook on the future than it had a week earlier. There’s no telling who Avila will keep and who he’ll let go, but the people who have helped built this winner will know that their track records won’t be forgotten by the new leader. Avila will have a chance to bring in his own manager, which I think he probably will. The team needs a fresh start in that department. It’s a chance to shake things up if the process has gotten stale, or an opportunity to keep it going if not. Change can be scary, but change can also be good. While the Tigers are carrying some contracts they probably wish they weren’t, they have a rich, committed owner and some really good players. There may be some lean years ahead, but the pillars of the franchise are strong and Avila knows where supply room is. We’ve complained around the margins about Dombrowski plenty, but there are few active general managers who have been more successful in their careers. Like we always say here, past performance doesn’t guarantee future performance, though. Perhaps Dave’s time as an elite GM is over, although the deadline sure indicated he can still throw heat. While this feels very much like the end of an era, very little has actually changed. That’s the weird thing about this and why I’m so convinced that Dave was the one who made this call. I’m encouraged by the fact that Ilitch approved the decision to sell and then kept everyone else in place. That screams of a stable, orderly transition. When I envisioned this a couple of years ago, I expected Dave would reduce his role and stay on as president, while giving the baseball operations to Avila. It’s the same result from a baseball perspective, but it’s possible that we’ll find ourselves at odds with the former Tiger before too long. Maybe I’m reading the situation incorrectly. Perhaps an impulsive owner fired the man he’s worked so well with because he was angry about an early postseason exit and a disappointing first half of 2015. And in his haste, perhaps Ilitch then simply promoted a man nearly as responsible for the state of the franchise and gave him a five year deal. Perhaps, but not likely. I think if this ever winds up declassified, we’ll learn Dave was ready to leave. He’s entitled to that. He made mistakes during his time in Detroit, but on balance, there was far more good than bad. He didn’t deliver the championship that Ilitch and the fans desperately covet, but leaves the Old English D in much better shape than when he found it. What Do The Tigers Have In James McCann? It’s a simple tool, but if you view every position player rookie by fWAR, James McCann comes in 14th with 1.3 so far in 257 plate appearances. There are all sorts of reasons why this isn’t a super useful accounting at the moment: rookies have wildly varying PA numbers, catcher defense isn’t measured terribly well in WAR, and everyone from about 8th to 25th on the list is close enough to McCann that WAR can’t really separate them very easily. The point isn’t that McCann is 14th best, but rather that McCann has been one of the more valuable rookies so far this year. That seems rather obvious to a Tigers fan, even if McCann isn’t among the Bryants, Duffys, and Pedersons of the world. With Alex Avila set to hit free agency at year’s end, there’s plenty of rumination in Detroit about what will become of the catching situation. McCann is doing a fine job so far this year, but will it continue and what kind of catching partner does he need? While there are a few MLB catchers who are good enough on their own that it makes sense to basically ignore their backups, McCann certainly isn’t at that level. Even if he’s a starter, there’s still room for a quality backup. Before we can answer that, we have to evaluate the James McCann we’ve seen so far. In 257 PA, McCann has hit .282/.315/.427, which is good for a 103 wRC+. In other words, McCann is just slightly above league average offensively per plate appearance. Keep in mind however that catcher is a depressed offensive spot and that the typical catcher averages an 88 wRC+ in 2015. Certainly, if this is who McCann is as a hitter, he will do just fine in the show. To give you an idea, a catcher with McCann’s current batting line, extended out to cover 450 PA (assume for a moment average defense and base running) would be something like a 3 WAR player. That’s not a star, but it’s an above average big leaguer. McCann runs like a not-Alex-Avila-catcher, though, so we should probably shave about 5 runs or 0.5 wins off that total for a full season before we move onto defense. Defense is where it gets interesting. McCann has been outstanding when it comes to preventing stolen bases. Using Baseball Prospectus’ Swipe Rate Above Average statistic, McCann ranks 8th among all catchers in SB prevention per opportunity. That lines up with what we’ve seen from McCann this year and his ability to release the ball very quickly while also delivering an accurate throw. We don’t have a full set of pop times for him, but we’ve seen 1.7 and 1.9 multiple times. He’s been great when it comes to nailing runners, and so far I haven’t seen any reason to think it’s dumb luck or sample size. McCann can’t throw you out if you steal off the pitcher, but basically no one can. When McCann is given a chance, he’s doing the job extremely well. When it comes to blocking balls and preventing runner advancement, McCann’s been solid as well. BP’s stat has him slightly above average at this as well, and the FanGraphs version will update late in the year, but I wouldn’t expect the numbers to be much different. McCann has certainly not been perfect in this department, but he has shown an ability to get in front of the ball. He won’t wind up adding a ton of value this way, but he won’t cost much either. So on defense, that leaves us with framing and game-calling. Framing-wise, the numbers suggest he’s been pretty rough. BP has him about 5 runs below average and Stat Corner has him about 10 runs below average this year. I wrote earlier in the year that I wouldn’t put much stock in the first few months of framing for a young catcher for various reasons, but this is obviously something to watch. From my observation, I do think he is worse than average at this point in time. Rather than quietly adjusting his glove position as he receives the ball, he does have a tendency to stab at it a little bit. I think some of this is probably just due to the horrible staff he’s caught this year and a general inability for them to command their pitches. You can frame a bad pitch, but it’s probably pretty difficult to frame pitches that are so routinely missing their spots. Especially for a young catcher who is just learning the league. I wouldn’t argue he’s been a good framer, but I’m not ready to write him off as a bad framer going forward. If we put the defense together, let’s call him something like +5 runs for the non-framing and -5 runs for the framing, with the acknowledgement that this could be way off or it could change. Game-calling is such a black box that it’s hard to judge what’s McCann’s doing, and what the pitcher and coach are doing. If I had to guess, I’d say he’s been a little worse than average in this department, and noticeably worse than Avila, but not in any sort of offensive way. Again, it could have a lot to do with the very poor staff he’s catching. Let’s call his defense a wash. We don’t know for sure, but I think we can say he’s probably around average with a bit of room to grow. Especially when it comes to game-calling, as he seems more than capable of working on this part of the game. So that brings us back to his bat. At this offensive level, he’s about a 3 WAR catcher for a full year. That’s a great piece to have. Even if he’s a bit worse, you still have an average player at the position, and it’s not out of the question he could be better. This season, he’s hitting .282/.315/.427. His walk rate is about 4% and his strikeout rate is about 20%. He has an ISO of .145 and a BABIP of .342. These numbers aren’t terribly out of line with what we saw from him in AA and AAA in 2013 and 2014. He’s a below average walk guy with a strikeout rate around league average and a respectable amount of extra base pop. Minor league BABIP is usually higher than in the show, but he was a guy who ran higher BABIPs in the minors, so we probably don’t have to assume he’ll come all the way back to .300. Before the season started, ZiPS/Steamer combined to forecast a .243/.279/.345 line from McCann (.277 wOBA). That projection has increased to .253/.288/.367 (.287 wOBA) after his 250 quality PA so far. In other words, the projections thing McCann’s true talent is about 5% higher now that they did in March. I will be the first to tell you that projections for players with little MLB experience are far from precise estimates. On average, they’ll be about right, but any one player could vary pretty significantly. So let’s unpack this. To start, the projections have been right about his BB and K mix. But the projections have not properly forecasted his BABIP and ISO. He hits a lot of line drives and ground balls relatively to fly balls, which could easily explain the higher BABIP. Line drive rate isn’t the kind of thing that stabilizes quickly for a young hitter, but based on what we’ve seen, I do think it’s fair to say that he does tend to have a swing that favors that kind of thing. Meaning: He will have a higher BABIP than league average. Will it stay at .340? Probably not. But let’s call it .320. The ISO is where it gets interesting, because this is the most extra base power we’ve seen from McCann to date. His best season in the minors was .132 and the projections see him in the .115 range. Right now, it’s .145. This is interesting because you look at McCann and actually think there’s more power in the swing that he’s shown. He’s hit some really solid homers and doubles and it doesn’t seem out of the question that he could be a 10-15 HR guy in a full season, especially once he gets comfortable. It’s widely accepted that catcher offense comes later that offense for most other positions. Now of course, 250 PA of a .145 ISO doesn’t mean much in the context of what normally happens to catchers with his career development to date. What I think is interesting is that McCann was such a bad hitter in 2011-12 that we might be measuring a player who had a rough transition to pro-ball but found his footing after a year or two. This is true of the scouts and the stats. McCann came out of college as an underwhelming, high-floor type guy. He’s the kind of player a lot of scouts undervalue, and then he came out an stunk in the low minors, leaving the stats to do the same. If McCann had hit well in the low minors, the forecasts might be different. There was a lot of confirmation in the early days of his pro-career, so perhaps we’ve all been a little slow to acknowledge his hit average or better in each of his last three stops. All in all, I think it’s safe to consider McCann’s walk and strikeout rates pretty well established. We’ll say he’s going to be a decent BABIP guy with some extra base power. That doesn’t make you a star, but that could easily wind up in the 95-105 wRC+ range for the next few years. And that’s discounting the possibility of any type of breakout. Put that all together with the glove and you have yourself a pretty solid 2-3 WAR catcher with some potential for more. And the downside for McCann is probably a really strong platoon backup, because he hits right handed and is definitely fine on defense. The Tigers have something here. He probably won’t be a star, but he can certainly be part of the answer. I think he pairs very well with Avila, if Avila doesn’t want to go out and search for a starting job. Avila’s a good OBP guy from the left side with really good defense and pitcher-leading abilities. Pairing him with the younger, higher upside of McCann could be a nice mix, especially if the lower work load helps Avila stay healthy and more productive. McCann has don some really exciting things in his early days as a Tiger, and while I don’t think we should overdo the expectations, he does appear to be ready for a sizable big league role. My sincere apologies to AL base stealers. The Tigers spent the last week trading away the rest of 2015 for something resembling a future. If you’re just catching up, I had plenty of good things to say about the strategy. Not only did they restock the farm system, they added players who are relatively close to the majors, giving them a shot to contend in the near future. It is absolutely too early to really figure out how good the 2016 team will be or what players they will have a chance to acquire, but I wanted to look at where the roster stands as it is right now. Players will get hurt, guys will get better and worse, and all kinds of things will happen. This is a snapshot to give us an idea of where the team needs to go. That’s all. Below, I’ve gone through the roster and identified players who I would consider safe bets to make the roster, along with their 2016 salary and my rough estimate of their 2016 WAR. So the Tigers need a new left fielder, they need to decide if Anthony Gose is going to be their CF or if they need a new one, and then the bench needs to be sorted out. They have candidates for all of those jobs, but no one is safe. They have four starters who are reasonably safe bets and then maybe Alex Wilson as the only reliever with a secure job. Realistically, Rondon, Alburquerque, and the others will have roles, but I wanted to outline the players who would definitely make the team if 2016 was starting next month. 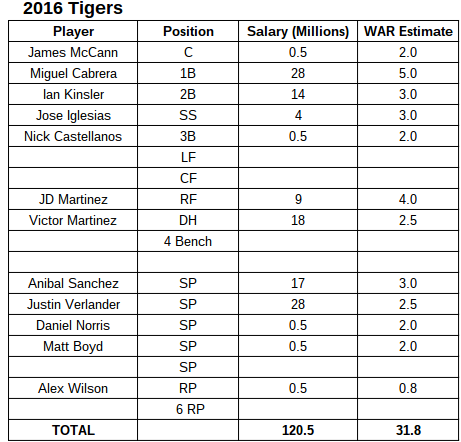 Obviously, the Tigers could trade any of these players, people could get hurt, etc, but this is where the roster stands. We can safely assume a payroll of around $170M, so that’s $50 million to use to acquire something like 10-12 wins (Note: Tigers owe Fielder $6M in 2016 as well). A replacement level team (all zero WAR players) would still win about 48 games, and that leaves a 32 WAR team around 80 wins. Getting to the 90-92 range requires some additions, but there are lots of ways to go. Let’s say you can get a total of 2 WAR from the bullpen outside of Wilson, that means you need a 4 WAR starter, a 3 WAR outfielder, a 2 WAR outfielders, and then 1 WAR from the bench. These are all just rough estimates, but those are relatively workable acquisitions. The Tigers need to acquire one good starter, a quality outfielder, and then some players who can fill various roles. The hardest part will be the bullpen because the Tigers don’t have a great history and because you need to acquire an excess of relievers at the start to get a good product at the end. As we approach the winter, I’ll identify specific players I’d target, but this gives us a good idea of where the team stands. Guys like Moya, Collins, and Romine can contribute, but you probably don’t want to plan your season around high expectations for them. I estimated the specific numbers, but I think they are fair estimates. Everyone is talking about the window closing, but the Tigers have the resources to stay competitive at least into 2016 as long as they don’t wind up getting overly tagged by injuries. Picking up two close to MLB ready starters this week went a long way to keeping this club competitive into the future.